Shares of Nvidia (NVDA - Get Report) continue to trade well, closing higher by 1.78% to $176.87 on Tuesday. The jump has Nvidia shares just below its 2019 highs and multi-month highs near $185. Can the momentum continue and allow Nvidia stock to reach $200? 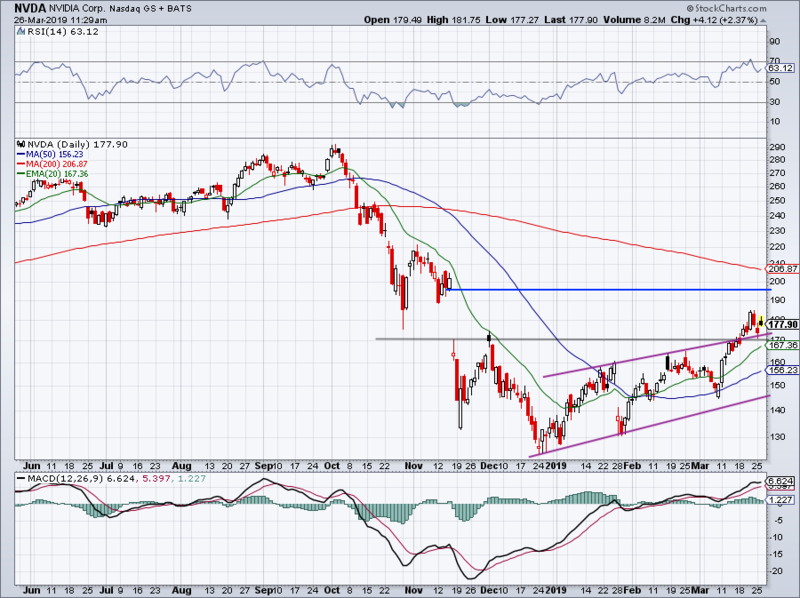 The semiconductor group has plenty of momentum right now, which is being seen in Advanced Micro Devices (AMD - Get Report) , as well as the Vaneck Vectors Semiconductor ETF (SMH - Get Report) . On Tuesday, Nvidia is getting a little help from the analysts at Piper Jaffray, who initiated the stock with an overweight rating and $200 price target. Keep in mind, this name has a 52-week high north of $292 and just had a very solid GTC conference last week. Let's take a further look at the charts. Nvidia is a holding in Jim Cramer's Action Alerts PLUS member club. Analysts bought shares of Nvidia Monday and say they will continue to "hunt for opportunistic levels to scale deeper into our most recent initiation." Want to be alerted before Jim Cramer buys or sells NVDA? Learn more now. 10-month daily chart of Nvidia stock. Nvidia's inventory- and bitcoin-related issues are well known, at this point. It's what caused the stock to tumble from $290 to $125 -- a decline of more than 55% -- in less than three months. Holy cow, that's disastrous for the bulls and dealt plenty of technical damage to the charts. Until Nvidia can prove to Wall Street that it's done cutting its outlook and can get back to its growing ways -- and it will, eventually -- we have to use some caution with the name. We're already 42% off the lows and while one could certainly argue that Nvidia stock didn't deserve to trade below $130, we have had a big bounce already. If the stock can maintain $170+, then taking out its recent highs seems reasonable. If that's the case, we need to consider a few upside targets. A few levels to consider include the 38.2% Fibonacci retracement at $189, the November gap fill level near $197, the 200-day (now near $207) and the 50% retracement up near $209. Finally, the 61.8% retracement is up near $229 and fills the gap down in October. I realize those are a lot of levels, but it pays to know where Nvidia stock could run out of fuel before pulling back or consolidating. On the upside, bulls can stay with Nvidia as long as it stays north of $170 and the 20-day moving average. Below and we'll need to reconsider the environment for Nvidia stock, semiconductors and the broader market.